In 1996, the Phoenix Zoo's first pair of wolves, Chico and Rosa, gave birth to 3 pups. The female pup was chosen by the American Zoo and Aquarium Association's Species Survival Plan and the Mexican Wolf Recovery Team to be paired up with a male wolf and released into the wild. On May 7, 1999 Chico and his new mate, Eureka, produced one healthy pup that was later sent to another breeding facility. In 2003 Eureka was retired to Southwest Wildlife Rehabilitation Center where she lives with a retired male. Currently the Zoo has Sonora and Morela, both females born in 2001. The related females are held on exhibit in the Arizona trail. There are no current plans to breed them. They are part of the SSP and are being housed in a large, naturalistic exhibit meant to properly interpret their current habitat type. Other species in the same area representing northeastern Arizona are thick billed parrots, bobcats, and a mountain lion. The wolves at the Phoenix Zoo are managed in a way so that the least amount of interaction as possible is made between them and the animal keepers. This is done to keep the wolves as "wild" as possible, by fostering behaviors and characteristics that will enhance their ability to survive in the wild. 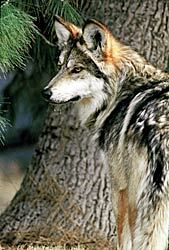 Wolf Awareness Week is an interpretive program that is held annually. During this week, lectures, presentations, and stands are set up to increase visitor awareness of wolf issues in general, and of the Mexican wolf reintroduction process in particular. Non-invasive research in coordination with the AZA's Reproductive Advisory Group and the Mexican Wolf SSP. Coordinated interpretive and research programs in collaboration with Southwest Wildlife Rehabilitation and Education Foundation, as well as other local and regional NGO's and zoos holding wolves in captivity. Review and input into the Wolf Adaptive Management Oversight Committee of the Arizona Game and Fish Department and cooperators during updates and public hearings.